A nasty quarter at the epicenter of the Great American Oil Bust. Greenspoint Place, a 1.5-million-square-foot, six-building office and retail complex on 36 acres, whose occupancy plunged below 40% when Exxon Mobil moved to its new campus, was sold at a foreclosure auction on July 5. It crowned a nasty quarter in Houston’s oil-bust office market. The complex was owned by a partnership of two giants: one of the world’s largest developers, Hines, and the General Motors Pension Fund. They’d acquired it in the 1990s. In July 2012, they’d refinanced the first mortgage of $145 million with Northwestern Mutual. Hines, with $89 billion of assets under management, could have easily kept the property, losing money as it went. But it chose not to. With its excellent insider knowledge of the market, it decided that this wasn’t a temporary real estate downturn, but that it was hopeless in the longer term and that it was better to bail out now. Let the lender take the losses. During the foreclosure auction, Northwestern Mutual Life submitted the “highest and best bid” of $77.5 million and ended up with the property, which it will try to market and lease. But finding tenants will be tough. 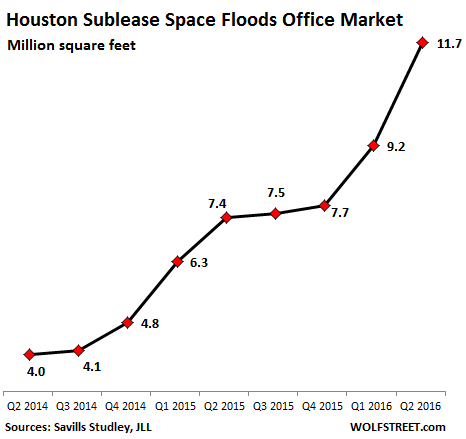 The entire office market of the North Belt/Greenspoint area, with 11.3 million square feet (msf) of space, got hit hard by Exxon’s departure, which vacated 2 msf at the worst possible time. Commercial real estate services firm Savills Studley just reported that the availability rate in the area hit a catastrophic 51% in Q2, the highest of any area in Houston. In Class A properties, it soared to 66%. Of the 193 msf of total office space in Greater Houston, 50 msf of space, or 26%, is available. That’s up 5.9% from Q1 and up 21% from a year ago! In Class A buildings, availability rose to 29%. Following on the heels of North Belt/Greenpoint is the Katy Freeway sub-market where availability jumped to 37% overall, and to 41% in Class A buildings. Hope? In Q2, there has been a “surprising jump,” as Savills put it, in activity: 2.9 msf were leased, up 75% from the frozen level in Q1. That’s still 18% below long-term trend of 3.3 msf, and “does not yet represent a reversal from the trend.” Over the last four quarters, 8.5 msf were leased, 36% below the 10-year average, and the lowest four-quarter volume on record. And much of this deal volume is companies vacating one office and moving into another, which doesn’t help the overall market that much. Plus, it wasn’t oil companies that suddenly decided to take on new space. Of the ten largest deals, nine were by non-energy companies accounting for 96% of the volume on a square-foot basis. The largest deal: American Bureau of Shipping leased the entire CityPlace 2 tower with 326,800 sf, which will break ground next year. So this doesn’t help the current market either. 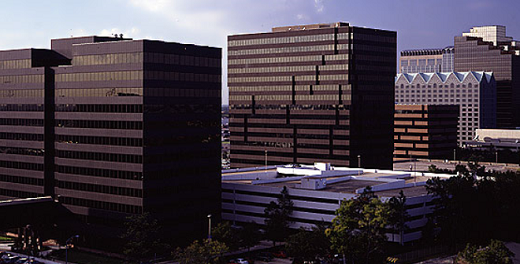 In fact, the office space it will vacate is in, you guessed it, the Greenspoint area. The sole energy company among the top ten is Patterson-UTI Drilling. It will move into 34,748 sf at the vacant and immensely desperate Remington Square III Tower, built last year. It will move out of its space in, you guessed it, the Greenspoint area. Companies are downsizing and trying to shed office space they leased years ago during the boom when they believed the industry hype that there would be an office shortage, but never occupied this space. This hogging of unused office space in itself creates demand and pushes up prices and fosters the illusion of a sustainable office boom – and a shortage. But now this empty space is hitting the sublease market overnight. And “see-through buildings” – a term coined during the 1980s oil bust for shells of buildings whose floors weren’t built out – are showing up again on the sublease market. Just in June, ConocoPhillips put the entire 597,000-sf EnergyCenter Four tower on the sublease market. It was completed last year, has never been used, and remains an empty shell. “See-through” because you can see through the building whose floors haven’t been built out. Shell, BP, BHP Billiton, and Noble Drilling also have at least 300,000 sf of office space each on the sublease market, waiting for a tenant. They’re responsible for this sublease space until lease expiration. Then it becomes the landlord’s headache. By 2018, about 30% of these leases will have expired, and by 2019, 48%. As the costs shift from tenants to landlords, they might decide that this is hopeless, as Hines had done. Landlords might then shuffle a big part of the loss to the lender. And according to JLL Houston, very little has been absorbed. Year-to-date, only 802,500 sf of it was leased in 140 deals with a “tiny” average of 5,732 sf. Just small companies looking for opportunities. In order to avoid marketing dramatically lower rates, landlords and sublessors continued to shy away from the concept of asking rates altogether. In the second quarter, only 26.8% of all available space was listed without face rent. In the sublease sector, rates were withheld for 58.1% of the available square footage. If there were only enough of these potential tenants! And if only they didn’t have to move out of their existing office space! American Bureau of Shipping is a classification society, one of about five offering such services around the world. Most of its revenue is from energy sector and shipping sector, both of which are hurting. It may not be an energy sector company, but its faith is very much interlinked to that sector and global trade overall. There are various other supplier companies that initially appear not to be part of the energy sector but in really are very much linked to it. Not all companies have been hit equally up to this point. With poor management prevailing across the wider sector that believes every new recovery scenario I am afraid the worst is yet to come. New rounds of layoffs are starting, such as Ensco, Schlumberger and Shell. For some this is an existential crisis. If it is soon enough to save their company remains to be seen. um, price down, volume down, employees down, is not conducive to real estate leasing. and moving companies only make one-way trips. so northwest as third party paid 50 a foot? shoulda paid 30, given the build-outs and chop-ups needed. Remember folks- according to some of the conspiracy theories about this oil glut ( about the 20 th price crash) this whole thing is engineered by the US to bust Putin. That’s just one of them but there are many. Of course Saudi hopes that the frackers will go broke- that’s not a conspiracy- that’s business. Boeing hopes Airbus will go broke. In Australia a market fight every bit as vicious is happening between iron ore companies, actually a bit more ugly because while oil has dropped by 50 %, iron ore has dropped 65- 80%. But because a lot of the battle is among Australian companies, it makes it harder to spin these geo- political plot stories. Very similar to what I have seen here in Netherlands for many years. Over here office vacancies have been massive and growing for 10-15 years, with many huge office buildings nearly or completely empty for years, often because the tenants have moved to a brand new (better) building thanks to sleazy incentives. But nobody cares: the developers of these buildings invest very little of their own money, almost everything comes from the banks who value the buildings based on asking rents. Banks have no incentives for real valuations either … So asking rents do not decline, no matter how low the occupancy rate. Everyone just buries their head in the sand. For small companies office rent remains stubbornly high; but larger companies can make nice deals like one year of free rent when signing a contract (just make sure you go bust after the first year …). There are some cracks in the facade though, a friend of mine just rented a large shop for 25% of asking rent – after one year the rent will be negotiated, but there are so many vacant stores in the area that it will be very difficult to increase the rent significantly. Expectation is that most of the empty office space will never be filled; by the time the economy might have recovered these buildings will be complete outdated. The latest plans are a fund that pays developers for demolishing older offices (undoubtedly with taxpayer money …) so asking rents can go up again, and converting office buildings for migrant housing. The same was suggested years ago already to improve the housing shortage for normal citizens, but it proved too expensive, and because the locations of most office buildings are not great for living there are limits to what one can ask. But maybe for the migrants no price will prove too high so who knows … some cities have spend 40-50.000 euro per migrant for housing last year! Like that in much of Canada too. Empty older buildings everywhere, but still new ones going up. Who’s eating the losses on those empty buildings? REITS I imagine, and property management companies. I saw and heard the same thing in ‘84-85 when doing market research in Houston. It was obvious to me that the area was in denial and not considering all the secondary and tertiary affects of massive commercial vacancies. These flood down through the local economy and take awhile to be seen. But they are very real and extremely widespread. Well paid architects, engineers and construction workers are first. But this is then followed by massive numbers of small business workers and many owners. There is much less need for furniture stores, car dealers, even non-obvious occupations such as dry cleaners and maids as this ripples through the local economy. BTW, The Dallas Fed says that jobs are down despite what the state employment commission is stating. I used to work with a guy who bought a sign company in Calgary. He was well on the way to being rich. These days, I’m afraid to ask. I would imagine Houston is the same, only bigger problems and higher losses. I can’t imagine any Oil town being worse than Calgary right now. Calgary is in a severe DEPRESSION, not even a recession. I live 3 hours from Calgary, hear lots of stories from folks, since many in my town have relatives who live there. Me too. That’s the same as saying, “Worst ever,” cause Calgary has not seen these kind of booms and bust prior to 30 years ago. Yes, oil town, but the booms and busts got worse as the companies and workers played riskier and riskier games. Please God send another boom and this time I won’t piss it all away. Again. We used to have those in Oklahoma, late 1980s and early 1990s. 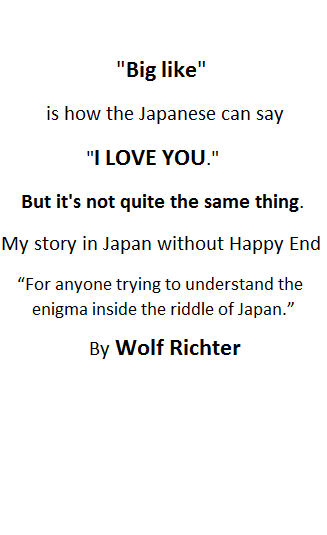 It didn’t help. I’m sorry, has anyone ever been to Greens Point? They call it Guns point… The Companies that own RE there are giving up on the area, not Houston.